Supplied with reversible latch adjustable from 60-70mm. Suitable for door thickness 34-45mm. 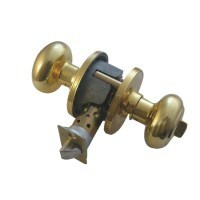 Both knob operate latch, thumb turn to lock from inside with emergency release on outside.